Notes: Bozcaada Castle (Turkish: Bozcaada kalesi) is a castle in the Turkish island of Bozcaada (known as Tenedos before the 15th century)Before the 14th century, there was a castle in the island. But there is no document about the constructor of this former castle. Phoenicia, Roman Empire and the Republic of Venice were among the possible constructors. However, the castle was demolished after the War of Chioggia between the Republic of Venice and the Republic of Genoa by the advice of the Pope. 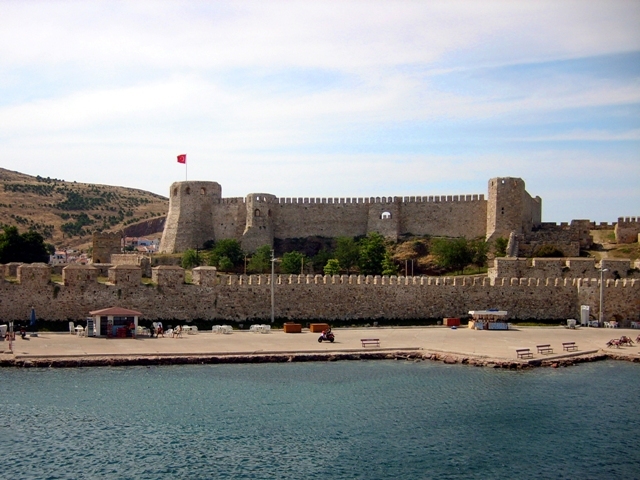 When Mehmet II of the Ottoman Empire conquered the island in 1455 he rebuilt the castle. In July 1656, during the Cretan War, a Venice fleet commanded by Giacomo Loredano captured the castle. But Ottomans under K�pr�l� Mehmet Pasha reconquer the castle in August 1667. Soon after the reconquest, the castle underwent a great renewall. A second renewal was carried on in 1815 by the sultan Mahmut II.